From Galvin Manufacturing’s founding in 1928 and their car radio that came to be known as Motorola, we can trace a direct path between the the Chicago-made innovations that shaped modern-day technology to the current generation of Midwestern inventors, makers and risk-takers who are creating products that will change the course of history. Chicago and Midwestern manufacturing have always been the heart of the nation's economy. It is an industry where smart, hard-working people come together to use machines, tools and human labor to transform raw materials into brilliant and useful new products. It also is an industry of people who know what it means to have the grit, discipline and work ethic to roll up their sleeves and do the heavy lifting. Launched in 2016, mHUB was the direct result of industry coming together to identify barriers to growth - and supporting solutions to overcome them. The founding advisers for mHUB were a group of more than 25 small and medium manufacturers convened by World Business Chicago. The cost of commercialization as a deterrent to innovation quickly surfaced as one of the largest threats to industry. Physical product makers faced high cost and little resources, so the idea for mHUB was born. 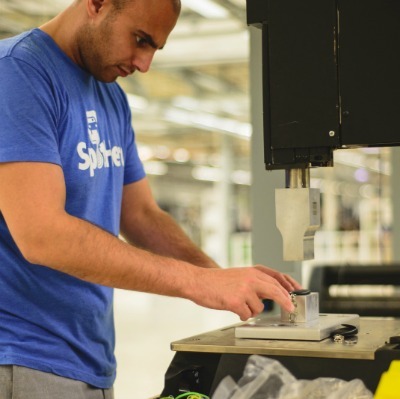 Our 63,000 square-foot facility contains 10 fabrication labs, including electronics, plastic fabrication, metals, textiles and rapid prototyping, as well as a microfactory for small production runs. The building originally housed Motorola Mobility's prototyping center, but the manufacturing connections at 965 W. Chicago Avenue run even deeper. In 1916, our site was home to the Milwaukee Iron and Metal Company, and neighboring businesses included a washing machine manufacturer and the Werner piano factory. Throughout the decades, the area has played an integral role in Chicago's manufacturing industry.